As you may have read the way the Libraries Taskforce works is changing. And this means the channels it uses to communicate what it is doing will also be changing. We’d like to gather your feedback on what you find useful and how you like to be kept informed, so that we can share this with the organisations who will be leading this communication in the future. We’ve already asked specific questions to those who receive certain products directly - such as our media monitoring weekly roundup, and will be sending questions with the next edition of the Libraries Deliver monthly newsletter, designed for frontline staff. If you’ve already shared your thoughts on those (or have ideas and comments about the newsletter), thank you! We’re now looking at communication more generally, and how you would like to be informed about the work of the Taskforce in future. Your feedback is valuable, and will help to shape our plans. It shouldn’t take more than 5 minutes to answer the questions in this short survey . 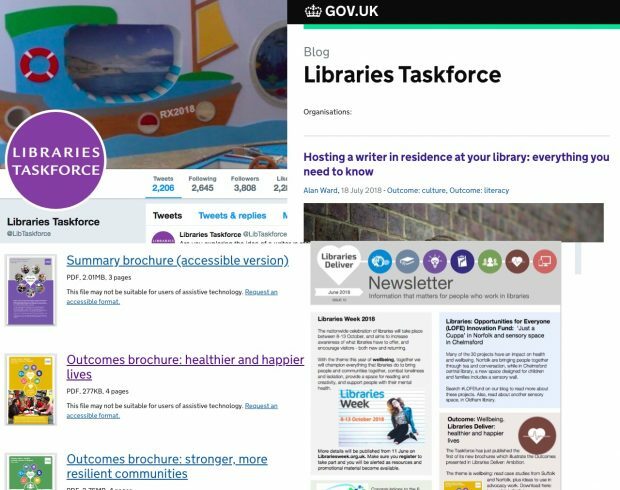 If you are unable to access google forms, please email us on librariestaskforce@culture.gov.uk and we'll share the questions in another format.